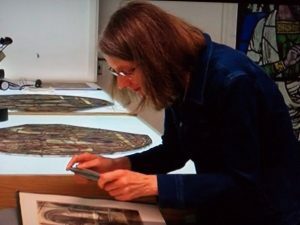 For those of you who live in the BBC South East region, you may have caught a news item on Canterbury Cathedral this week where Dr Raphel Koopmans and Leonie Seliger talked about their wonderful discoveries involving the dating of the glass in one of the Becket miracle windows above Henry IV’s chantry chapel. Of special note is an early roundel from the late twelfth century that they think shows pilgrims heading to Canterbury. These pilgrims are depicted as men from different socioeconomic groups – on horseback, walking, a crippled, poor men who receives alms – a tripartite division that might be said to echo others including the spiritual Trinity and the secular orders of medieval society – those who fight, those who pray and those who work. And remember, you heard about this before the BBC’s viewers as readers of the Centre’s blog a couple of weeks ago. The three groups of Canterbury pilgrims. As I mentioned last week, I have been away at the Fifteenth Century conference at the University of Reading. Among the speakers there was Dr Chris Briggs (University of Cambridge) who opened his plenary lecture by telling his audience about the case of a felon called Robert Cat from Preston next Wingham in 1419. The importance of the case for Chris is the list of Robert’s property and goods and chattels that were recorded by the escheator as forfeit to the Crown. Consequently they had to be valued, in the case of the property its value in terms of the rent paid, and the goods as their sale price. Among the goods Robert was said to have owned were an old cow, two small bacon, grain and various pots and pans, in total valued at 32s6d. 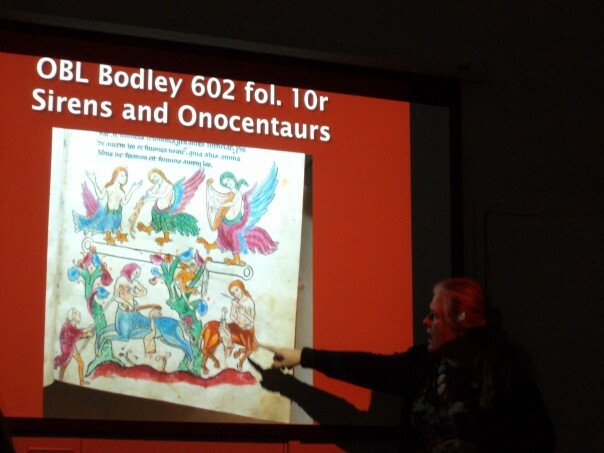 Rachel Koopmans examing an early print of the Becket window. 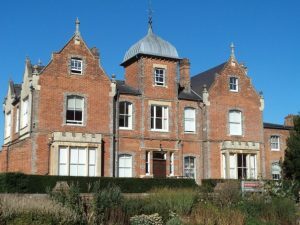 The reason why Chris is so interested in such records is that he is leading a Leverhulme Trust funded project on rural living standards and material culture from the decades after the Black Death to the later decades of the 16th century. The idea behind the project is to test the current contradictory historiography regarding whether there was a rise in such standards for those living in the countryside and the implications of this for the consumption of goods – did people have more or less brass pots, were they of better/poorer quality as measured by their resale value? 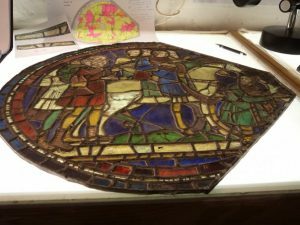 To achieve this, Chris and his team are looking at three different sets of records, two at The National Archives at Kew – Escheators’ Records c.1360-c.1500 and Coroners’ Records c.1500-c.1600, to which they will add findings from archaeology. From the example above, I expected you have gathered that Kent is one of the counties the team will be looking at. Indeed, they are looking at fifteen counties in all, although only for Worcestershire, Hampshire and Wiltshire will they look at all the felons’ inventories because in the other counties they are only recording those in the countryside and in small towns, and they are also ignoring felons of elite status. Chris showed the audience some of the preliminary results they now have for the late 14th and 15th centuries concerning the mean and median levels of the overall valuations. These are interesting and for the 15th century would seem to show a downward trend to about 1460, after which it is very difficult to know because of changes to the escheators’ recording practices. As Chris recognised during questions, there are certain methodological issues with the approach and he accepted that there are a number of caveats, just as there were with studies such as Barbara Hanawalt’s study of coroners’ inquests regarding gendered peasant working practices in The Ties that Bound (1988). However, it will be interesting to see how this project progresses as it moves into its third and final year. A paper that drew far more on Kent, and specifically Canterbury materials, was Dr David Grummitt’s (Canterbury Christ Church University) on the incident at the five gardens and meadows called the Rosiers just outside the city’s Westgate. As David said, he had been drawn to this violent event that involved a group from Christ Church Priory and the city’s party led by the mayor by the research of Dr Rebecca Warren, who had studied late medieval Canterbury society for her Masters, and more recently he had supervised Dr Stuart Palmer’s doctoral thesis on Tudor Canterbury while at the University of Kent. David described in some detail what was said to have taken place at the Rosiers in 1500, events during the immediate aftermath and in the early part of the decade that followed, drawing on the records at Canterbury Cathedral Archives and Library and those at The National Archives. He then set this Church versus City conflict in the context of earlier events in the 15th century when previous members of the city’s governing body had taken on the other great monastic house at Canterbury, St Augustine’s Abbey. Furthermore, he noted that such incidents had not been confined to the 15th century and that disputes over territorial lordship, often with financial implications, had been very much part of the city’s history for centuries, albeit there were also times when City and Church had worked together towards a common goal. Of course, as he said, such relations are hardly unique to Canterbury, however by teasing out the various threads it is possible to explore ideas about negotiation and relationships among these different constituencies that have implications for our understanding of urban society in the later Middle Ages more broadly. This proposition was borne out by the second paper in this session where Joe Chick (University of Warwick) examined the history of early Tudor Reading. 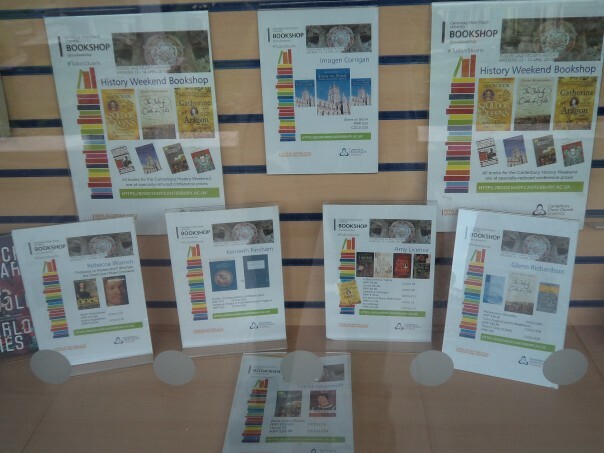 In this case the main protagonists were Reading Abbey and the Merchant Guild, and, as Joe explained, Reading’s desire for and progress towards greater civic autonomy needs to be seen against a rise in the town’s cloth trade, and, as at Canterbury, the growing influence and use by the leading citizens of high status Londoners and their counterparts in Henry VII’s government – the ‘new men’ described by Dr John Watts in his Henry VII and the Politics of Kingship (1996). 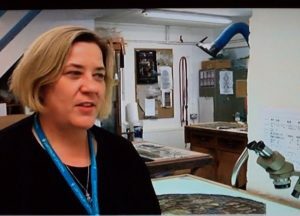 Finally, and there will be more information in future blogs once the screening date has been released, Dr Diane Heath and I met up with a documentary film crew yesterday to film something about Canterbury’s medieval history. This was a very interesting and enjoyable experience, even on an exceptionally busy Saturday in the centre of the city because there were large numbers of Morris Dancers and others – the hop harvest. However, we did find a few slightly quieter streets such as Palace Street and The Borough, much to the interest and amusement of shoppers, tourists and others. So another busy week, and it won’t be long before it will be the Nightingale Lecture on Tuesday 25 September at 7pm (wine reception from 6.30pm) in Old Sessions House when Professor Peter Vujakovic, a well-known member of CCCU’s Geography department, will speak on ‘The map as biography: maps, memory and the Kent landscape’ – entry is free, no booking required, though there is a voluntary retiring collection for the Centre and the Agricultural Museum Brook. And this coming Thursday in Newton Ng07 at 7pm there will be a joint Centre and FCAT lecture on ‘Pigs in Medieval Kent’, again booking not required, just come along.